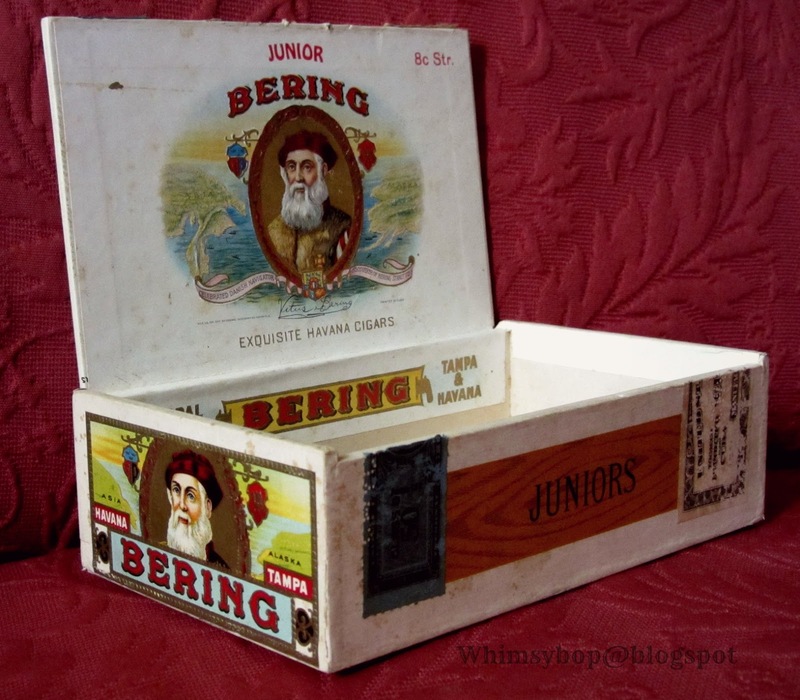 Whimsybop: Collecting vintage cigar boxes: Cigar anyone? Collecting vintage cigar boxes: Cigar anyone? My first job after being honorably discharged from the Navy was in a shopping mall working at a coffee store, grinding beans and whipping up specialty coffee drinks - ahh, the aroma was delicious! Only one other place in the mall smelled just as wonderful to me and that was the tobacco store next door. 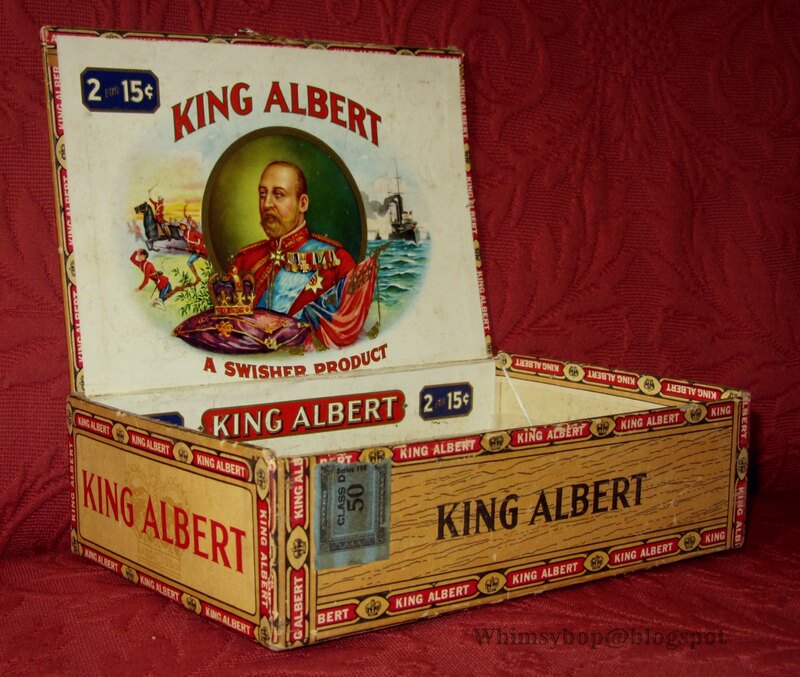 I loved going in there on my breaks because just inside the tobacco store's entrance was a stack of empty cigar boxes for sale: $1 for the cardboard boxes and $3 for the wooden ones. 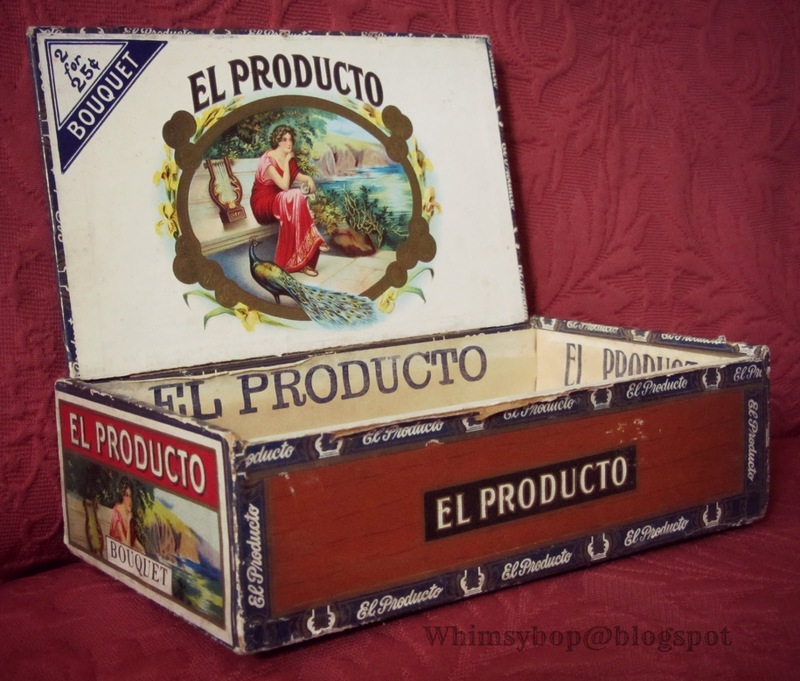 I was particularly attracted to the wooden boxes and bought them to make crafts out of them, transforming them into quirky little purses or jewelry boxes (that was during my Modge Podge years). coffee barista was over, I was in an antique store when a cigar box caught my eye. The beautiful artwork, vivid colors and typography style made me want to take it home - and a collection was born! 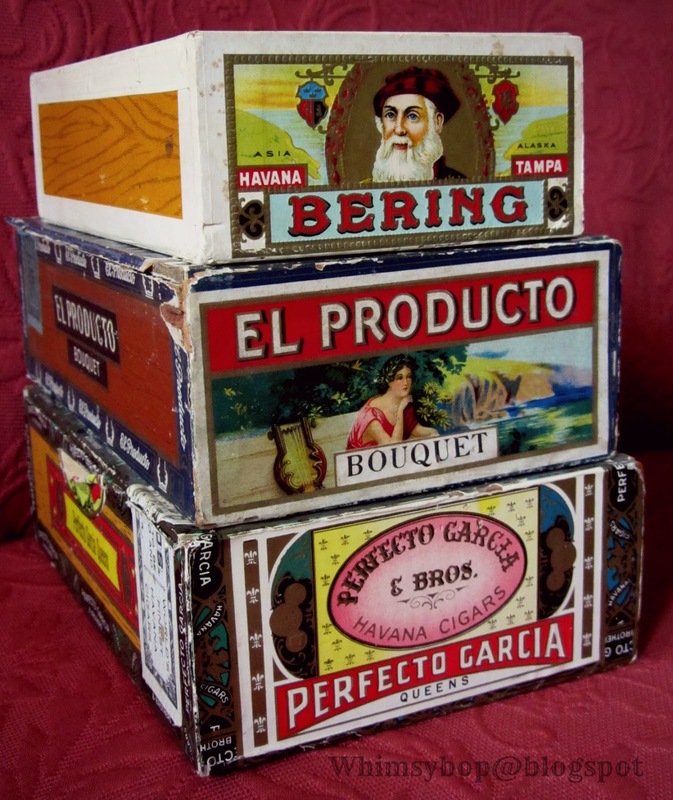 Most of the cigar boxes in my collection have come from antique stores, estate sales and flea markets. 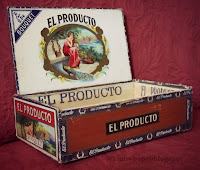 Cigar boxes can be found anywhere from the $2 - $45 range, depending on the condition of the box, the graphics on the box and the rareness of the brand of cigar. 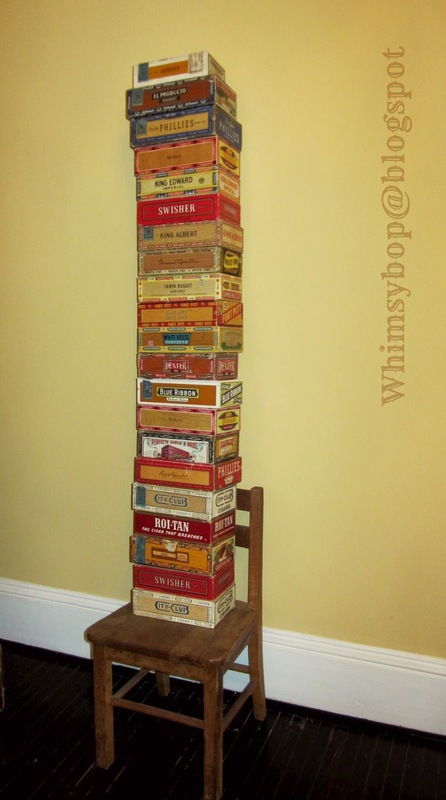 I try to keep my cigar box budget under $5, which is why my collection is rather small. 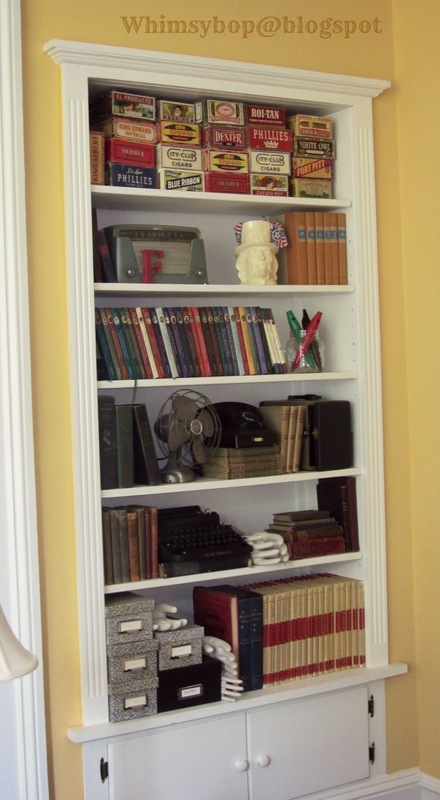 I often display them stacked in a tower of color, either on the floor or on a chair. Unfortunately, since they are made of cardboard, the stack can't get too high on account of the lids caving in beneath the weight. Currently mine are perched on the top of a built-in bookshelf in the living room, which allows me easy access to the weird and wonderful treasure I keep inside each one. Sometimes I find the boxes with labels attached to them where folks have used them through the years to store various items inside such as stamps, nails & screws or tax receipts (I know this because I've painstakingly soaked and peeled off such labels). I actually don't mind finding labels on them because it's proof of what kept the box from being discarded - and every collector should be thankful for that! 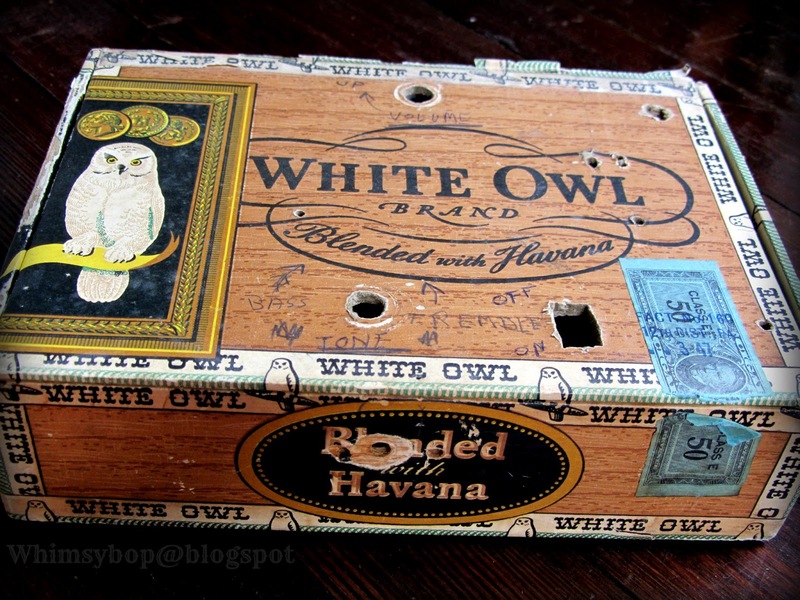 This White Owl box is one of my favorites. I found it at the Pickens Flea Market in South Carolina with my Dad, who was just as excited to see it as I was to buy it. 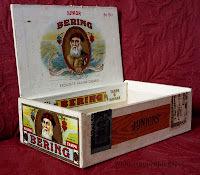 The box brought on a wonderful memory he shared with me of his high school shop class where he and his classmates were instructed to make transistor radios from cigar boxes - and they actually worked! 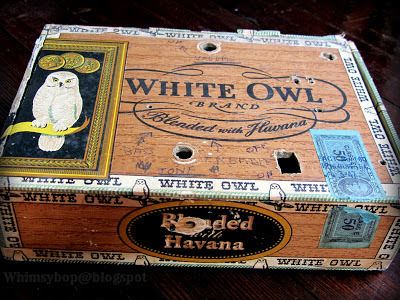 If you look real hard at this photo, this White Owl box has the holes cut out as well as pencil markings diagramming where the knobs would be placed (pretty neat!). My dad was known to smoke a cigar from time to time and as little girl I was intrigued to watch the smoke curl around his face and dance off into the air in mysterious swirls. Unlike my Dad, however, I have never had the desire to smoke a cigar - except in my dreams. Oddly, I have had a recurring dream for most of my adult life in which I smoke, and seem to immensely enjoy a cigar (that's one dream that would make for an interesting interpretation!). When I think of someone enjoying a good stogie my mind immediately goes to the late George Burns, the iconic cigar smoking Hollywood legend. Mr. Burns and I shared a special moment many years ago when I (in my early twenties) collided with him as I raced through an airport to catch a connecting flight and nearly knocked the old man over (my only brush with a celebrity). Perhaps it was that brush with Mr. Burns which was the catalyst to my recurring cigar smoking dream...hmm, now there's something to ponder.